Unicycle Rose: Is your dog bikini ready? Wiener Dude is looking good! Let me explain why I ask. I love The Weiner Sisters, our daschunds, Sara and Goldie. Our sons have tagged them with other monikers that have stuck this past year. Sara has always been overweight, thus her nicknames are Fatty and Over Chunk (fitting, but sad). Lord only knows why they named Goldie, Pumpkin Seed (kids come up with the strangest things!). When my Cutie Pie sent me a recent article, I thought of our Over Chunk and felt better about her long history of being overweight. No pun intended. The true story is about a daschund named Obie that is probably the Biggest Loser of any Weiner dog ever! Last September this pooch took on a fitness challenge to slim down his 77-pound bulk! This has taken him one-step at a time. Literally. Obie flaunted his 40 lbs.-slimmer physique during a Mother's Day hike. 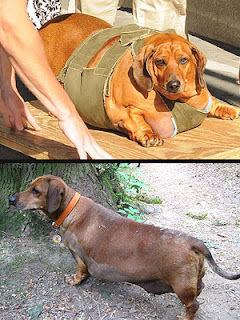 He recently has undergone surgery to remove the excess skin between his legs due to his weight loss. A dog tummy tuck? It’s good to have health goals and perhaps pets are no exception? Currently weighing in at 42-pounds, Obie still has about 7 lbs. to lose from his 35 lb-frame. So, again, I ask. Is your dog ready for the upcoming swimsuit season?